How do I change my currency/distance unit? Go to the Company page and select the “Edit” link. You will now be able to set the currency, date format, distance unit, and several other global settings. Does Book Rides Online have an app? Book Rides Online released the BRO driver app in January 2016. All current customers of Book Rides Online can have their drivers download the app for FREE at both the iTunes store and GooglePlay store. Our customer and admin. apps are in development and will be coming out sometime this year so stay tuned! How much does Book Rides Online cost? Our price can’t be beat! We have three package options starting at only $59/month and we bill month to month. Book Rides Online believes in being up front about our cost so there are no set up fees, you can cancel whenever you like or upgrade/downgrade to get the best bang for your buck. We also offer a free 30 day trial that allows you access to our entire software so you can be sure we’re the right fit for you before paying. To cancel your account click your name located in the upper right hand corner of the screen. This opens a drop down menu where you can select “Account & Billing”. On the Account page you’ll see a button labeled “Cancel My Account”. Simply click this button and then confirm your decision to cancel your subscription. An email confirmation will be sent shortly after. Is Book Rides Online a white label product? Yes! Book Rides Online is a white label product. Once you are fully set up, all of your communication with your clients will have your information and logo on it. We also offer a passenger app that can be white labeled for additional charges. Want to know more about our white label passenger app options? See “Passenger App“. Currently Book Rides Online does not offer demos, but we do offer all first time clients a free 30 day trial of our entire program. You will have access to each and every feature of our software. We believe that our clients should love our software before being stuck with the bill. After you’ve logged into your account, click your name in the upper right corner of the screen to drop down a menu. You’ll see a link to “Account & Billing”. From there you’ll be able to update your billing information from the billing page. Please note: Only an “owner” account can update billing information. How can I find my next billing date? 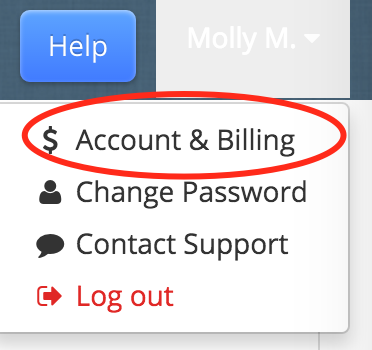 Your next billing date will be listed under the “Account & Billing” page. You can find this by clicking your name located in the upper right hand corner of the screen. A drop down menu will appear and you can choose the option “Account & Billing” from here. Located on the Account page you will find your next billing date. Does BRO have SMS capabilities? Yes! You can dispatch runs to your drivers via SMS, drivers can send SMS messages to clients with an ETA and dispatchers can also get an SMS time stamps of drivers as they digitally log through their run (departure times, arrival times, time in, time out etc). Check out our tutorials for setting up Run Progress SMS. Also we’ve just released our new driver app which allows clients even in countries other than the US to send ETA and arrival texts to clients using driver’s numbers. BRO is just shorthand for Book Rides Online. So anytime you see BRO, we’re just abbreviating. What if BRO doesn’t have the currency or airports I need? We are more than happy to add any currencies or airports that are not currently in our system that you may need. All you need to do is email us at info@bookridesonline.com with your request and it will be added promptly! Is there any way to attach my Customer Satisfaction survey to BRO? Can I customize my trip sheets? Currently, Book Rides Online offers a limited amount of customization to your trip sheets. To see what you may be able to customize, see our tutorial on Trip Sheet Preferences. What is a client B.R.O. Account? In some of your settings and under client profiles you will see options to make a client’s “B.R.O. Account” be active or not active. If a client has an inactive account it really just means that they don’t have an “account”. It means that the information you have on them is really more of a client profile for you to use when creating reservations and collecting payment but they rely on you to input reservations and input their information. If you make a client’s B.R.O. Account active, this means that they will be sent a username and password that will allow them to sign in and update their information, add billing information safely and request reservations. Customers can sign into their accounts directly on the website form living on your website or log into the passenger booking app. See our Website Form Setup for more information about how you can do this. How do I reset a driver or employee password? If you need to reset the password for any employee of your company, follow the directions in our tutorial on Editing Employee Information. Can I reset a client password? Yes! To reset a client password see our tutorial on Resetting Client Passwords. If you’ve forgotten your password, press the link provided directly underneath the login area that says “forgot password? Reset it here”. A window will pop up asking for your username or email address. Once you’ve entered it, we’ll send you an email with a new password. If you can’t remember your username you can email us at info@bookridesonline.com. Why can’t I get my email set up? Be sure to fill in all of the necessary information about your email address. You can find the tutorial of what you need to fill in here. If you believe you’ve filled in all of the correct information regarding your email address but are not getting a message stating it’s correct here are a few trouble shooting methods you can try. 1. Try checking/unchecking the SSL box. 2. Be sure you have the correct port and smtp entries. You can google these easily. 3. Be sure you’ve entered your email address correctly as well as spelling your password correctly. 4. If you have a gmail address, please use the red button for gmail set up instead of the email fields. 5. If you still cannot seem to get your email address set up, please contact us at support@bookridesonline.com and we would love to assist you. Why isn’t my website form working? Setting up your website form can be complex at times because there are a lot of settings and information to input before it’s all set to go. If you’re having trouble setting up your pricing information see our tutorial on setting up your website form here: “Setting Up Your Website Form“. If you have already initially set up your form and can’t seem to get a request for service to submit from your website, please see this help article: “Trouble Shooting Your Website Form“. What is SSL Encryption and Why do I Need it? In order for you to accept clients credit card directly from your website on our website reservation form, we require you to have SSL Encryption/Certification on your website. You can touch base with your website host provider to set up your SSL Encryption. Why do you need this? In order to meet PCI compliance regulations and to ensure the safety of your customers’ credit card information, you must have this on your website. It’s the only safe way to protect your clients’ information and keep it safely stored. Fleet Tracking doesn’t seem to be working? Why? It’s really important that your driver have the appropriate settings in their phone to allow our app to track in the way that you need. Be sure to read this help article on our Fleet Tracking: Fleet Tracking to ensure that you’ve gotten all of your settings correct. If all else fails, you can always contact us at support@bookridesonline.com. I’m new. What should I do first? If you’re new to Book Rides Online and want to set up your trial program to see if we’re a good match for you, here are some helpful hints as to where to start when setting up. 1. Enter your Vehicles and Employees. 2.Test out inputting a reservation from within the system from the “Reservations” tab (tutorial found here). 3. Take a look at the Website Form set up and test it from your website. 4. Set up your Email. From here you can take a look at the many other features we have to offer. And as always, ask for assistance if you need it! support@bookridesonline.com. I would like to contact support. How can I do this? If you’re having a hard time finding an answer here on our help website, you can always feel free to email us at support@bookridesonline.com and we will get back to you right away. Our help website is to be used as a tool but doesn’t mean we don’t want to hear from you when you need help! When downloading the driver app to your mobile device, some Android users may experience issues downloading the app and receive an “Error 505”. Unfortunately, this is a device error that can happen at any time to any app on certain droid devices and is not an issue with the driver app. We cannot fix this issue from our end, but you can google this error code to find possible solutions or see our article on Solutions for a 505 Error Code. How can my clients access the client portal? If your clients have an “active” BRO Account, they can log into their accounts on your website form. 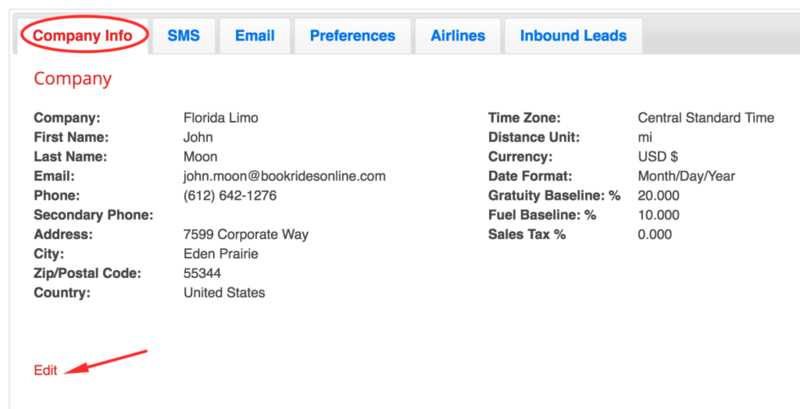 This would be the website form that you integrated directly into your website for clients to use to request trips and get quotes. If you do not have a website or do not use our website form on your website, you can give clients an “active” account in the settings of their Client Profiles found on the “Clients” page. Making their accounts active will send them an email with a link to their portal with username and password. Each time you correspond with them via email, there will be a link for them to use to get to the portal. Customers now can also access their accounts via our free Book Rides Passenger App. You can direct them to this free version of the app or your white label version if you have one set up with us. Don’t know what a BRO Account is? See What is a Client BRO Account? How do I make a client’s account “active”? Want to give your client’s a username and password that they an use to log into your website form/client portal or the passenger booking app? It’s pretty simple. Go to the “Clients” page, find the account of the client you’d like to give an “active” account and open up their profile. You’ll see a setting marked “BRO Account”. Set this to “active” and it will send your customer their username and/or password. You can also set up your website form to automatically allow customers to create their own username and password when using your form. For more information on this, see Website Form Settings.